The Japanese PM doesn't need an untrusted US President setting his international security agenda. Japanese Prime Minister Shinzo Abe managed a canny mixture of deference and guile when he rushed to New York last November with a gold-embossed golf club to be the first foreign leader to meet the newly-elected Donald Trump. The question now is whether Trump can return the favour as he kicks off his Asian tour in Tokyo with the inevitable round of golf. With Germany's Angela Merkel drifting to the centre, Abe is now arguably the world's most substantial conservative leader, having just won his fifth (upper and lower house) election with highly personalised and economic and foreign policies. Given his own troubles at home, Trump should be impressed by Abe's return from the oblivion of his first failed short term in office in 2007 and his ability to regularly regain pubic support. Trump should also show some deference to Abe's experience on the real front line of the North Korea nuclear threat and his efforts to keep the once US-sponsored Trans-Pacific Partnership (TPP) trade deal on life support while the US flirts with protectionism. This certainly didn't seem to be the case when the US put the hard word on Japan to enter a bilateral trade negotiation last month just days before Abe faced an initially difficult election – which he eventually won quite soundly. Trump's erratic gambits on how to deal with North Korea have also left Japanese officials nervous about what he might do in a crisis. But the two men have had 14 phone calls and eight meetings since that original get-together at Trump Tower, so this is potentially a relationship of global significance – one that seems to have overtaken the once-celebrated bromance between former Australian Prime Minister Tony Abbott and Abe. In the lead-up to the Tokyo meetings today and tomorrow, the Trump Administration has already paid Abe the compliment of lending support to his longstanding push for a more formal security relationship in the region between the US, Japan, India and Australia in order to send a signal to China. The challenge will be whether Trump can maintain an approach to North Korea in line with Abe's firm and disciplined stance, and not embarrass his host with demands for unilateral trade concessions just when Abe is trying to secure a TPP agreement at next week's Asia Pacific Economic Cooperation (APEC) group meeting in Vietnam. The US decision on the weekend to extend Trump's already long Asian tour by one day so he can attend the full East Asia Summit in the Philippines will help his image in the region. It also suggests US officials think Trump can actually stick to the script for almost two weeks. But two developments in the immediate run-up to the Tokyo stopover underline that even though Trump may have a bond with Abe, he has a lot more work to do with the Japanese public. 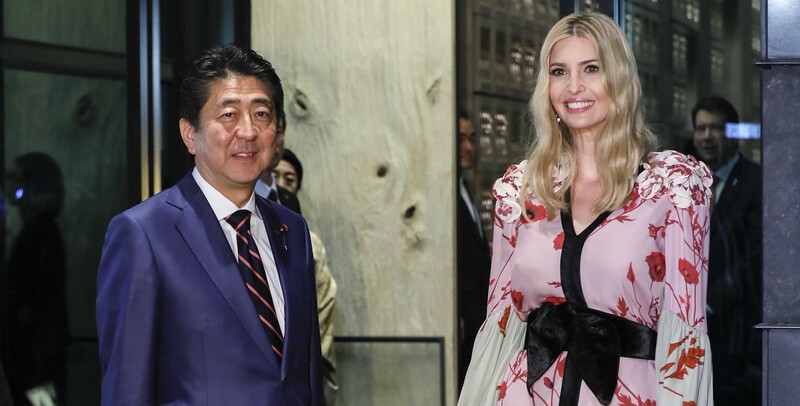 While his daughter Ivanka has been credited with helping make the original meeting last year a success and was feted by the Japanese media ahead of a visit to Tokyo last week to pave the way for her father, her main public event was surprisingly poorly attended. New polling by the Pew Research Centre also shows a sharp decline in Japanese confidence in the US and Trump at time when the North Korea threat demands a relationship of trust. Only 24% of Japanese trust Trump, even lower than the 29% trust reported in Australia, and a massive decline from the 78% confidence in former President Barack Obama last year. And only 57% of Japanese view the US favourably, down 15 percentage points since last year and the lowest level since 2008, although it is higher than the 48% favourability in Australia in the same poll. Trump left for his Asian trip with some comments about Japan in a television interview that were likely intended to play up Abe as a tough, strong leader, but which may not go down so well with Japanese people. He told Fox News: 'Japan is a warrior nation, and I tell China and I tell everyone else that listens, I mean, you're gonna have yourself a big problem with Japan pretty soon if you allow this to continue with North Korea.' While he didn't explain the reference, it is consistent with the US president's past sympathy with the idea of Japan developing its own nuclear weapons partly to reduce the cost of the alliance for the US. This is unlikely to be helpful domestically to Abe at a time when he is trying to carefully maintain public support for a constitutional referendum simply to recognise the country's Self Defence Force as a conventional military force that can operate abroad. The election victory three weeks ago was significantly helped by disastrous infighting among the country's opposition politicians. Nevertheless, Abe now has his best-ever mandate to achieve his long-term dream of normalising the status of the country's military. Unlike past efforts, Abe has been noticeably cautious about constitutional reform since the election, instead emphasising that he is focusing on stimulating the economy and delivering election promises on child care and education. Media reports suggest the referendum may still be as far away as 2019, with Abe saying he has 'no predetermined schedule' and wants 'to forge a broad agreement'. This restraint is yet to win over the public. Opinion polls show Japanese remain undecided about the referendum and even more cautious about nuclear armament and nuclear power. Abe certainly doesn't need an untrusted US President setting his international security policy agenda. PNG PM Peter O'Neill's alleged confrontation with Zuckerberg, GoJek beating out Uber, Pokemon GO in Asia, and more.